The 21stAnnual Sacramento Arts Festival—the best ever in quality and variety—returns to the Sacramento Convention Center Friday, October 26 – Sunday, October 28. This festival has become not only the premier art and craft show in the Central Valley, but is also one of the top art festivals in the country. The festival features over 225 of America’s best local and national contemporary craftspeople and fine artists offering more than 15,000 original works. Strolling through the festival, attendees can shop for themselves, their home and for one-of-a-kind Christmas gifts. 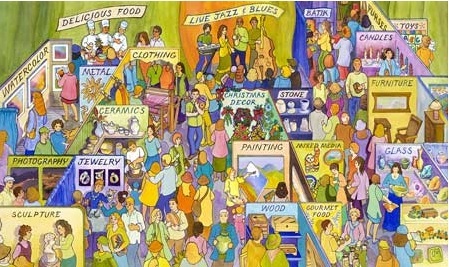 Shoppers will find spectacular works of art and craft in all price ranges including jewelry, ceramics, clothing, decorative fiberworks, furniture, glass, leather, literary arts, metalworks, paper, stone, woodworks, drawings, oil and acrylic paintings, watercolors, sculpture, photography and two and three dimensional mixed media. Unlike other area fairs, the Sacramento Arts Festival is strictly juried with exhibitors selected for their originality and art quality. Attendees have the unique opportunity to observe and interact with artists who will share their creative passion and knowledge. Artists will also demonstrate their extraordinary talents on site. In addition to all the visual art, the festival features continuous live Main Stage entertainment including the GG Amos Blues Band, The Kurt Ribak Jazz Quartet, and Yolo Mambo World Music Quartet. Hungry festivalgoers can dine on Restaurant Row from great local restaurants offering a variety of delicious edibles including Greek, Indian and American cuisine. Admission: $8 Adults, $7 Seniors, Children under 12 FREE.